Thank you so much, James. So wonderful to sit with you and your colourful cards and have the benefit of your wisdom, skill and compassionate presence. I’ve always been happy to recommend you to others and will continue to do so. This piques my curiosity about the qualities mentioned, so here’s a bit of a reading around them, using the Jungian Tarot by Robert Wang. What is wisdom? PRINCE OF PENTACLES, UPRIGHT. Wisdom is to pay close attention to what is real and grounded in a self-assured manner. What is skill? FIVE OF PENTACLES, UPRIGHT. Skill is to adapt one’s tools, resources, and reality from a place of responsible authority. What is compassion? FOUR OF CUPS, REVERSED. Compassion is to act on deep, deep feelings, to be the agent of spiritual relationship, and to give one’s cosmology a home. What is presence? TEN OF WANDS, UPRIGHT. Presence is to set one’s personality aside temporarily so that one can be dedicated to the “I-Am-Ness” in the moment. When I piece these together, the cards suggest to me that the client felt that hir tarot consultation with me was an experience of paying close attention to the reality of hir situation, adapting the tool (the tarot, in this case) to suit that reality, and bringing our larger maps of how the universe works together into the same safe space in a temporarily egoless moment. I ask Life that this may continue! What Classes Do You Need? 1. What topic or focus would enrich, support, or benefit you the most in the form of a single 90-minute teleseminar in July or August of this year? 2. What topic or focus would enrich, support, or benefit you the most in the form of a multi-session weekly series (six to eight sessions) in the Autumn of this year (in the northern hemisphere)? Please really feel into these questions and listen to your body’s inner guidance, then respond in the Comments. Thank you in advance for your participation in this! 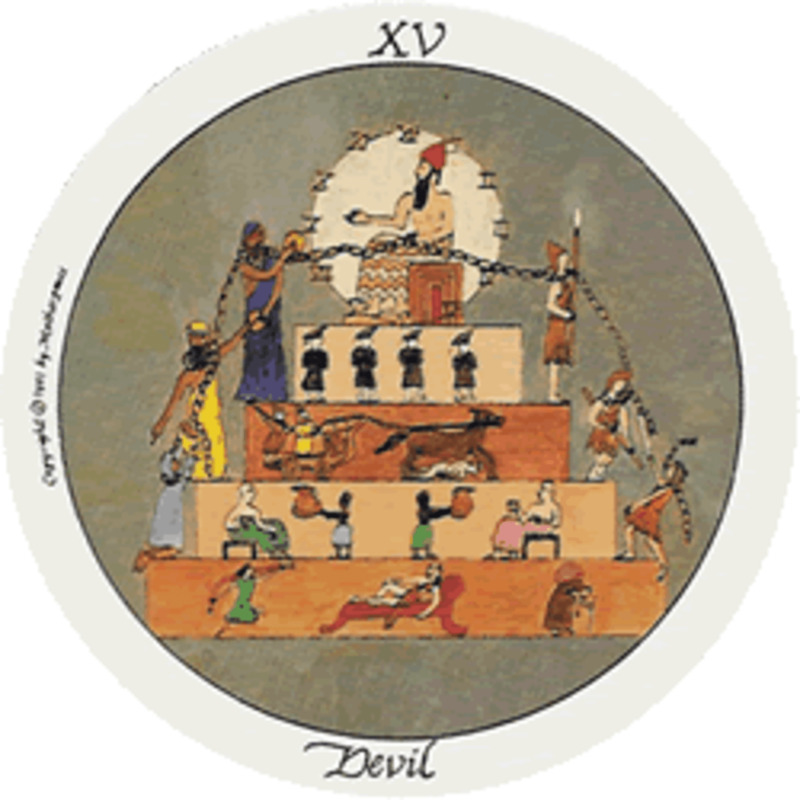 Yesterday, Trump XV, most often called the Devil, was my card for the day. Here are two poems that it called forth from me. This structure: temple or prison? This boundary: saviour or oppressor? This responsibility: commitment or burden? This container: temenos or muzzle? Image: Devil from the Motherpeace Tarot by Karen Vogel and Vicki Noble. A couple of days ago, someone on Facebook posted a link to The Top Five Regrets of the Dying by Australian author Bronnie Ware. These top five regrets inspired a fruitful online conversation and prompted me to create a five-card tarot layout to help us live a life that’s less regret-filled and more fulfilling and authentic. You can use tarot cards, runes, crone stones, soul cards, gifting bones, or any other divinatory insight tool. You can also use the five layout questions as prompts for journal writing or for verbal sharing in a circle-based conversation group. If desired, you can preface the entire spread with a specific time frame — e.g. “Throughout the coming year…” or “This season…” — or you can let your insights resonate for a lifetime, your choice. How can I remain true to myself? How can I remember to set work aside for other important things? How can I develop and maintain the courage to express my feelings? How can I remember to stay in touch with people whom I love and value? How can I demonstrate my choice to be happy? Please try out this spread and let us know what comes up for you, or feel free to have a session with me to help you explore these questions. I hope that you’re happily surprised and nourished by Life’s responses! I belong to several Facebook groups that are for professional tarot practitioners. In one group, the topic of good boundaries recently came up. I suggested that we post those we have for ourselves with regard to our tarot work and those we have for others with regard to our tarot work. Another member suggested that in addition to stating the boundaries from our own perspectives, it might be interesting to add the tarot’s viewpoint. Here is my own list. I will do no more than three hours of client work on any given day. In all of the tarot consultations I offer, I will stick with my belief that we are beings of choice, not beings of fate, and will use language that is consonant with that belief. For every card we explore, I will always return the client and myself back to the question or spread position so that we remain within the intention(s) we have set. Pre-payment secures an appointment with me. Sending me your responses to the intake questions that I send to you secures an appointment with me. The session begins at the agreed-upon time, so please be on time when you call, skype, or show up because we’ll end at the appointed end time. 10 of Swords, reversed: I will put my inner mental chatter on hold so that I can pay attention to the client. Queen of Swords, upright: I will communicate with the client in a competent manner, employing my most mature language. Tower, reversed: In each session, I am simply a catalyst for inner change. 5 of Wands, reversed: Please come into the session willing to change your view of who you are. Fool, reversed: If you’re going to put your trust in anything, let it be in yourself and your Greater Power. King of Cups, reversed: Please leave behind the notion that this is a “psychic reading”.